WASHINGTON — Special counsel Robert Mueller has finished his investigation and submitted his report to Attorney General Bill Barr on Friday, according to a letter that Barr submitted to congressional lawmakers, ending the most politically significant criminal investigation in decades. 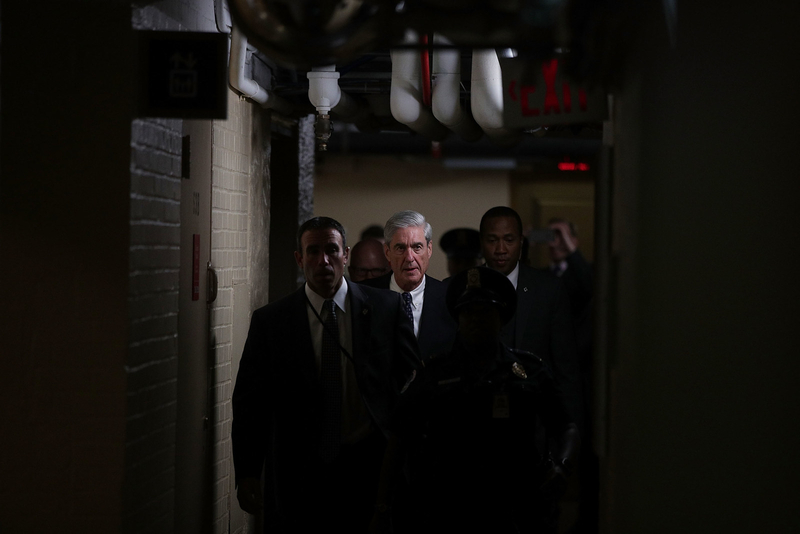 What exactly Mueller said in his report isn’t public — yet. Barr will have the power to release Mueller’s findings in the future, but for now the document is secret, as required by federal regulations. Barr will have to submit a report of his own to Congress, which he can make public. There’s also little stopping lawmakers from releasing Barr’s report once they get it. Mueller completed his investigation over a nearly two-year period that featured regular attacks on his work from President Donald Trump. From the start, Trump blasted the investigation into whether his campaign colluded with the Russian government as a “witch hunt,” and questioned the lawfulness of Mueller’s appointment, the objectivity of the special counsel team, and the scope of the probe. But in the end, fears that Trump would try to get rid of Mueller — left-wing groups pledged to take to the streets in protest if that happened — went unrealized. The conclusion of Mueller’s investigation ends weeks of fervent speculation. Predictions that Mueller was almost done have been cropping up for more than a year — in November 2017, the Washington Post reported that Ty Cobb, who was serving in the White House’s counsel’s office at the time, was optimistic that Mueller’s investigation would be over by the end of the year. Under federal regulations, Mueller’s report to Barr is “confidential.” Mueller will have to explain “prosecution or declination decisions” — when he decided to bring charges, when he didn’t, and why. The regulations don’t require Mueller to include any other information in his report, but he isn’t prohibited from doing so, either. Although Mueller’s report is “confidential,” Barr will have discretion to make all or parts of it public. In a rare show of bipartisanship concerning the special counsel investigation, the House of Representatives voted 420–0 on March 14 to urge Barr to make Mueller’s report public. It was a resolution, which isn’t binding on the Justice Department but reflects the intense public pressure on Barr. Barr can make his report to Congress public if it “would be in the public interest.” There is no rule that would block Congress from releasing whatever Barr sends, unless it includes classified information. Mueller was appointed by Rosenstein in May 2017 as special counsel to oversee the Justice Department’s investigation into Russian interference in the 2016 election, and whether there was collusion with Trump’s campaign. To staff his office, Mueller tapped past and current federal prosecutors, who brought experience ranging from the Watergate investigation and mafia takedowns to international terrorism cases. Working out of an office in southwest Washington, DC, about a mile from Justice Department headquarters and across the street from the city’s morgue, Mueller’s team quickly developed a reputation for keeping a tight lock on its progress. Leaks were few and far between, and prosecutors repeatedly managed to secure grand jury indictments with no word getting out before they unsealed charging papers. The first person charged by Mueller’s team, former Trump campaign adviser George Papadopoulos, was arrested in August 2017 and made a secret court appearance that October to enter a guilty plea — he admitted lying to investigators about his contacts with Russians leading up to the election. His arrest and the charges didn’t become public until the case was unsealed nearly a month later. The indictment against Trump’s former campaign chair Paul Manafort was unsealed the same day Papadopoulos’s case became public. Manafort and his former right-hand man, Rick Gates, were charged with a string of financial crimes, although none related to their work on Trump’s campaign; Gates had served as deputy campaign chair, and worked on Trump’s inauguration. Manafort ended up facing two indictments — a federal jury in Virginia found him guilty of tax and bank fraud charges, and he pleaded guilty to fraud and witness tampering conspiracies in DC. He was sentenced to spend nearly seven years in prison, and recently was hit with new fraud charges by the Manhattan District Attorney’s Office. Gates pleaded guilty in February 2018 and agreed to cooperate with Mueller’s office and any other law enforcement office that needed him. He has not been sentenced yet. On March 15, Mueller’s office asked to again delay Gates’ sentencing, saying that he “continues to cooperate with respect to several ongoing investigations.” Prosecutors also charged Manafort associate Konstantin Kilimnik with conspiring with Manafort to tamper with witnesses in his criminal case. Kilimnik isn’t believed to be in the United States and has not participated in court proceedings. In total, Mueller’s office brought criminal charges against 34 individuals and three Russian entities; 7 people have been convicted so far. Former national security adviser Michael Flynn pleaded guilty to lying about his contacts with the now-former Russian ambassador during the presidential transition; he has not been sentenced yet. Trump’s former lawyer Michael Cohen pleaded guilty to lying to Congress and was sentenced to two months in prison, a sentence that will run at the same time as the three years Cohen will spend in prison for financial crimes he pleaded guilty to in a case brought by the US attorney’s office in Manhattan. Alex van der Zwaan, a Dutch lawyer with ties to Manafort and Gates, pleaded guilty to lying in the investigation and spent a month in prison. The special counsel’s office also got a guilty plea from Richard Pinedo, a California man who admitted orchestrating an identity fraud scheme that Mueller’s office said Russians used to finance election interference efforts; there was no evidence Pinedo knew he was aiding that, though. He was sentenced to six months in prison. Mueller’s charged 13 Russian nationals and three Russian entities, including a troll farm known as the Internet Research Agency, with trying to interfere in the 2016 election through disguised social media campaigns. Only one defendant, Concord Management and Consulting, has participated in the case, and is fighting the indictment. Prosecutors also charged 12 Russian intelligence officers with hacking the Democratic National Committee and Hillary Clinton’s campaign chair John Podesta and leaking thousands of emails to WikiLeaks. None of the defendants have participated in court to date. The newest case brought by Mueller’s office is against longtime Trump adviser and ally Roger Stone. Stone is charged with lying to Congress about his communications with WikiLeaks during the campaign; he pleaded not guilty. The special counsel’s office brought Stone’s case with the US attorney’s office in Washington, and, in a sign that Mueller was planning for the eventual dissolution of his office, the DC prosecutors have largely taken the lead in Stone’s court appearances. Prosecutors from outside of Mueller’s team are also already involved in the two cases against Russian nationals, and they’ll be poised to take over once Mueller disbands his office.